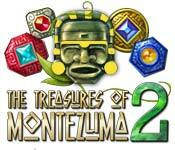 The Treasures of Montezuma 2 is rated 4.2 out of 5 by 13. Rated 5 out of 5 by melissa845 from Great Game for Match Three Enthusiasts I have played almost all of the Montezuma games and although I would recommend gamers to think about them as a series......I think Montezuma II is by far of one of the best. It could also be that it is the only one I beat all the way through with no replays (LOL). It has three levels one can play.... including casual, normal, and really hard. I really like seeing the color totem guys doing their thing and of course power ups can be bought. 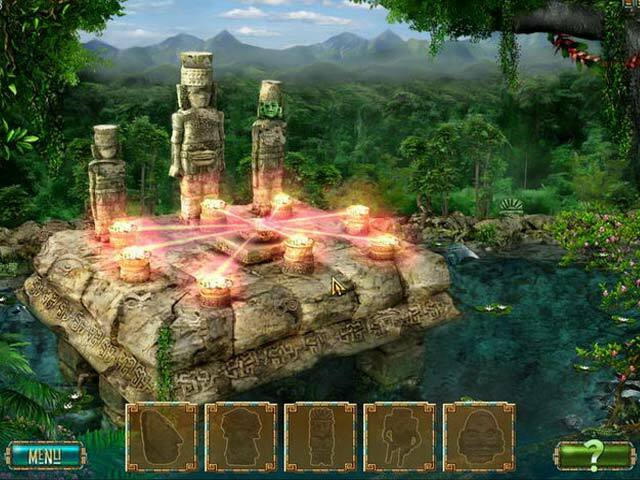 It is a game to concentrate on but one can replay different levels if you want. It is very important to prioritize what you want... for me it helped to choose the jewels and the clocks.. Rated 5 out of 5 by Prendergast from Best Game Ever!!! I have had the Treasures of Montezuma game for many years. I always hoped they would come out with another game. I just saw tonight they now have 2 thru 5. Amazing!! These games are the best of all the games I own. I have played the original one over and over and never got tired of it. Very challenging. I love it. Rated 5 out of 5 by AwesumDude from Loved the Montezuma 2 I tried it due to the great reviews about it and nbrs 3 & 4. It really is fun. Great looking graphics, good sound, and it is addictive. It was hard to walk away from my first game experience. I bought it after trying it. I highly recommend it. Rated 5 out of 5 by sushifiend3 from OMG!! I just loved,loved,loved this one. I am a big fan of hidden object games and did not expect to find one hidden in this game. Although it was a small one,it caught me off guard. OMG, it was awesome. The fun level in this one was to much. I would buy this one(plus the other two). I did not know if I would like to play the endless part(I think that is what it was called),but when I reached it in the trial version I did play it and it was more fun than the regular game itself. More explosions, more points,and just plain good old fun. This is the most fun I have had in a long time on a match three game. I also love it when the guy keeps saying"score frenzy".Totally makes this game exciting. Thanks again to BFG,and whoever made these games...I love yall. Whoever does not like this game may not have gotten as far on this one or did not pick the endless part. Rated 5 out of 5 by ffuryy50 from My favorite Match 3 Game... Imho, the best match 3 game out there.... It's actually three games in one -- puzzle mode will tax your brain -- it's a lot of fun tho, so don't miss it. There's also "endless" mode and the "normal" match 3.... I don't usually feel I have to beat the time or get all gold in a game (altho green is the highest score here) -- but this one's so much fun, I did go back and replay levels to get all green.... I recommend starting at the normal level and work your way up through all three levels. The power ups are a lot of fun and very helpful.... At the end of each location, you must complete an HO scene -- and they are challenging, but fun.... Overall, a great game and I highly recommend it -- even if you don't normally play match 3.... The puzzle mode is challenging and keeps me trying.... easy at first, but gets much more challenging as you go along.... Enjoy! Rated 5 out of 5 by RyeMcLaughlin from Excellent Match 3 Simple boards, but lots of strategy, especially at higher levels. As the game progresses you purchase power ups. You activate them by making multiple matches of a particular color tile. Bright colors and clear graphics. There are 3 modes of play - Adventure, Endless, (after 1st bonus) and Puzzle (after 2nd bonus). 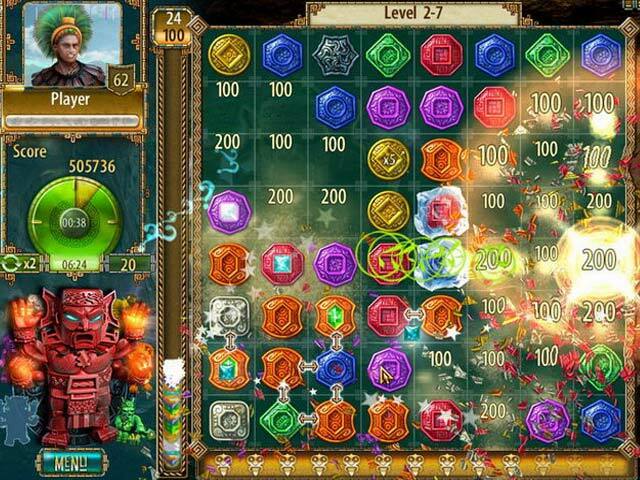 In Adventure, there are 5 levels each with 8 boards and a bonus game. It's timed, but that only counts for winning awards. You can play as long as you need to. You can replay boards to get the gold. Rated 4 out of 5 by mrm2006 from What A Fun Game Wow! And here I thought I was a seasoned M3 (match 3) player. Graphics: Amazing. Bright, colorful. Sound: Bombs bursting all over the place makes this a very fun game. The music was very calm and relaxing. Gameplay: There is only 1 mode of difficulty to play to begin with and that is the Adventure Mode. I took that to mean it was a story mode and was not timed but relaxed. I was right. 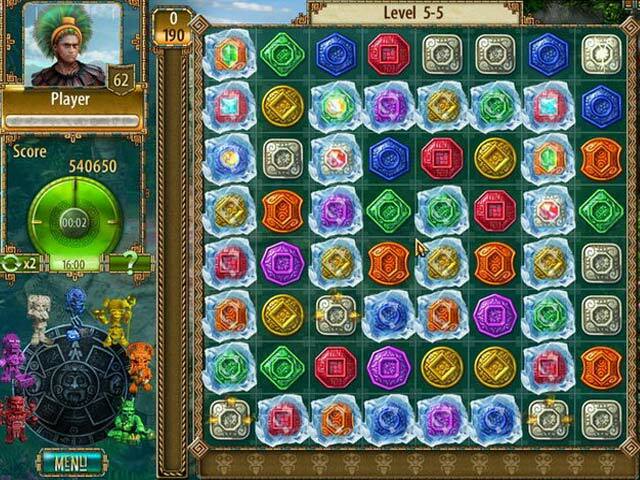 Your job, of course, is to make as many match 3's as possible, particularly the jewels that have a diamond center. There is a leader board on the left side of the screen that fills with tiny jewels as you make those match 3s with the diamonds but since this isn't timed don't freak out if the leader board is slow to fill up, just concentrate and enjoy the game. You earn bombs as well as buy them as bonuses. It appeared that you also purchased pieces of buildings and land as you go along. And there is a bonus level at the end of each 10 levels (I think it's 10 levels). This is NOT a game for beginners. I am an Intermediate game player and a seasoned M3 player but not seasoned enough for this game. There is no tutorial and no indication of what to do, except "buy this" and that stops after a short while. Knowing what to do is important, not just in the actual game play (i.e. unfreeze the frozen jewels) but in how to purchase land and it appears you have to pay to advance to the next level, after the previous bonus level. I got stuck, didn't know what to do, didn't have enough coins (earned through the game play) to purchase anything and ended up just replaying the las.t level out of frustration. But I HATE to replay anything so I quit. I wish there had been a tutorial. I truly enjoyed playing this game. It was bright, colorfrul and fun. Thanks devs and BF for bringing this game to us. This Glam-ma says give the free trial a try, that's what it's there for but you do have to do a fair amount of figuring out what to do. As I said before, NOT a game for beginners. Happy Gaming to all. Rated 4 out of 5 by spinkat from Great Game! If you liked the first one - this one is more of the same, which is great! Medium level of difficulty - I have been playing match 3 for awhile and this is straight up HO all the way. Maybe adding in puzzles would break up the HO gameplay a bit.